Minimizing total respiratory heat loss is an important goal during mechanical ventilation. The aim of the present study was to evaluate whether changes in tracheal temperature (a clinical parameter that is easy to measure) are reliable indices of total respiratory heat loss in mechanically ventilated patients. Total respiratory heat loss was measured, with three different methods of inspired gas conditioning, in 10 sedated patients. The study was randomized and of a crossover design. Each patient was ventilated for three consecutive 24-h periods with a heated humidifier (HH), a hydrophobic heat-moisture exchanger (HME) and a hygroscopic HME. Total respiratory heat loss and tracheal temperature were simultaneously obtained in each patient. Measurements were obtained during each 24-h study period after 45 min, and 6 and 24 h.
Total respiratory heat loss varied from 51 to 52 cal/min with the HH, from 100 to 108 cal/min with the hydrophobic HME, and from 92 to 102 cal/min with the hygroscopic HME (P < 0.01). Simultaneous measurements of maximal tracheal temperatures revealed no significant differences between the HH (35.7-35.9°C) and either HME (hydrophobic 35.3-35.4°C, hygroscopic 36.2-36.3°C). In intensive care unit (ICU) mechanically ventilated patients, total respiratory heat loss was twice as much with either hydrophobic or hydroscopic HME than with the HH. This suggests that a much greater amount of heat was extracted from the respiratory tract by the HMEs than by the HH. Tracheal temperature, although simple to measure in ICU patients, does not appear to be a reliable estimate of total respiratory heat loss. It has long been considered desirable to provide warm and humid inspired gas to mechanically ventilated patients, and various methods to achieve this have been proposed [1,2,3]. Mechanical ventilation with endotracheal intubation or tracheostomy bypasses the upper airway and the normal heat-moisture exchanging process of inspired gases. A continuous loss of heat and moisture occurs, which predisposes patients to serious airway damage [1,2,3,4,5,6,7]. In addition, medical gases are dried to avoid condensation damage to valves and regulators in the distribution network. Complications after ventilation with cold gases may be prevented by the addition of exogenous heat by the use of heated hot water systems - vaporizers or nebulizers. HH systems have some disadvantages, including the following: condensation of water, which may be a source of infection; malfunction; high maintenance cost; and increased nurses' workload . The introduction of light, disposable devices that effectively conserve heat and moisture of inspired gases could be a solution to both the problem of humidification and that of heat preservation [9,10,11,12,13,14,15,16,17,18,19]. HMEs preserve patients' heat and water, and overall recover 70% of expired heat and humidity [10,11]. HME efficiency, as compared with that of HH, is a matter of controversy. Importantly, the performance of HMEs is dependent on the tidal volume given to the patient [10,11,17,18], and some studies [20,21,22] have reported endotracheal tube occlusion caused by inadequate airway humidification with use of HMEs in ICU patients. Temperature of expired air is affected by the temperature of inspired air [23,24,25]. The mechanism whereby inspired air composition influences expired air involves the reciprocal exchanges of heat between the respiratory tract and the respired air stream during the inspiration and expiration phases. The explanation for this effect is that the heat extracted from the respiratory tract during inhalation is then extracted in the exhaled air. Thus, if inadequate heat is provided in the inspired air, then total respiratory heat exchanges will be significantly increased . We hypothesized that tracheal temperature, which is easily measured in mechanically ventilated patients, could be a simple and reliable index of total respiratory heat loss. We therefore prospectively studied a cohort of ICU patients to determine whether changes in total respiratory heat loss could be evaluated from concomitant changes in tracheal temperature. Ten patients were included in a prospective, controlled, unblinded study. The study was randomized and of a crossover design. Each patient was ventilated for three consecutive 24-h periods. With Institutional Review Board approval and informed written consent from the patients' families, we studied tracheally intubated, mechanically ventilated patients, who were sedated with sufentanil. The patients were stable following the initial management. They needed mechanical ventilation for acute respiratory failure after neurological crisis or multiple trauma including head trauma. The ventilatory circuit consisted of inspiratory and expiratory lines connected by a Y-piece. The ventilator used was an Engström Erika (Engström Medical, Sweden). Respiratory rate, tidal volume, fractional inspired oxygen and positive end-expiratory pressure were adjusted to maintain arterial partial oxygen tension above 80 mmHg and arterial partial carbon dioxide tension between 35 and 40 mmHg, and these parameters were not modified during the study period. Ventilators used dry medical gases delivered by the hospital distribution network. The design of the study was as follows. Changes in respiratory heat exchanges were induced by using three different methods of gas conditioning. In a randomized order and in a crossover manner, patients were ventilated for 24-h periods with a HH (Bennett Cascade 2; Nellcor-Puritan Bennett, CA, USA) and one HME (hydrophobic HME [Pall BB100; Pall Europe Limited, UK] or hygroscopic HME [Bact-HME; Pharma System AB, Sweden]). where V = minute ventilation; ρ = volumetric mass of the ventilatory gas (ρ of N2 1.25 g/l, ρ of O2 1.43 g/l); Cp = specific heat of the gases (Cp of N2 0.2487 cal/g per °C, Cp of O2 0.2198 cal/g per °C); Tex = temperature of expired gas; Tinsp = temperature of inspired gas; λ = latent heat of water evaporation (585 cal/g H2O); AHexp = absolute humidity of expired gas calculated from Tex with the hypothesis that expired gases were fully saturated in water vapor (relative humidity 100%); and AHinsp = absolute humidity of inspired gas . Tracheal temperature was measured from a thermal probe placed 3-5 cm above the carina and displayed on a chart recorder (Yokogawa T, 4153 HA 323928, Tokyo, Japan) Maximum and minimum temperatures were obtained during a given respiratory cycle. Maximum tracheal temperature was the highest temperature measured during expiration, and the minimum temperature was the lowest temperature measured during inspiration. Absolute humidity (AH) and relative humidity (RH) were obtained using the psychrometric method. A device to separate inspiratory and expiratory gas flow was inserted between the Y-piece and the endotracheal tube or between the HME and the endotracheal tube (Fig. 1). In the inspiratory limb of the device, two thermal probes -one wet and one dry - were inserted. The psychrometric method is based on comparing the temperatures obtained with the two thermal probes. The upstream probe measures the actual gas temperature. The downstream probe is coated by sterile cotton that is wet with sterile water. Evaporation in the inspiratory limb is directly proportional to the dryness of the inspired gas. The temperature gradient measured between the two probes increases when inspired gas humidity decreases. When the inspired gas is fully saturated with water (100% RH), no thermal gradient is measured. No probe was inserted in the expiratory line. Both the inspiratory and the expiratory lines were equipped with two directional valves to avoid inadvertent mixing of inspiratory and expiratory gases. The internal volume of the device was 75 ml (30 ml for the inspiratory line and 45 ml for the expiratory line). Temperatures recorded by the two probes were measured and displayed on the chart recorder (Yokogawa T, 4153 HA 323928). The ventilatory circuit consisted of inspiratory and expiratory lines. Measurements were performed using two ceramic electrodes, and inspiratory and expiratory flows were separated by four one-way valves. Patients were consecutively ventilated with the HH and the HMEs. where AHs (mgH2O/l) = absolute humidity at saturation point (100% of RH), and T (°C) = dry probe temperature. RH, AH, average gas temperature in the inspiratory limb, maximum and minimum tracheal temperatures, and total respiratory heat loss were obtained for each device after a 45-min period for optimal stabilization. Then, the same parameters were collected after 24 h of ventilation with the HH, and at 6 and 24 h with the tested HMEs. Results are presented as mean ± standard deviation (range). Intergroup and intragroup comparisons were performed using one-way or two-way analyses of variance where appropriate. P < 0.05 was considered statistically significant. Ten patients were included in the study (eight men, two women) with a mean age of 45.1 ± 15.4 years (17-60 years) and a mean weight of 73 ± 14 kg (50-80 kg; Table 1). Tidal volume was 649 ± 90 ml (420-760 ml), respiratory rate was 16.8 ± 4 breaths/min (12-25 breaths/min), positive end-expiratory pressure was 3.0 ± 3 cmH2O (0-11 cmH2O) and fractional inspired oxygen was 0.50 ± 0.2 (0.3-0.7). Table 2 shows the total respiratory heat changes of the ventilated gases with the three systems used for conditioning of ventilatory gases. Total respiratory heat loss was significantly less with the HH than with either HME (P < 0.01). Values are expressed as mean ± standard deviation (range). *P < 0.01 versus hydrophobic and hygroscopic HME. Table 3 shows the evolution of tracheal (maximum and minimum), room and body temperatures. No significant differences were observed in either maximal or minimal tracheal temperatures with any of the three devices tested. Thus, total respiratory heat loss could not be predicted from measurements of tracheal temperature. Tracheal temperatures were well maintained with each device over the 24-h study periods. Room and body temperatures did not show any significant differences over the study periods. Room temperature was measured at the patients' bedsides. Body temperature was obtained in the oesophagus. Values are expressed as mean ± standard deviation (range). Table 4 shows the evolution of inspired RH and AH over the 24-h study periods. With regard to both RH and AH, the HH achieved the best performance when compared with the other two devices (P < 0.001). The two HMEs achieved the same levels of RH, and no significant changes were observed with time. With regard to AH, the hygroscopic HME achieved a significantly better performance than the hydrophobic HME during all of the three periods. No significant modifications in AH were observed after 24 h of use with either HME. Values are expressed as mean ± standard deviation (range). *P < 0.001 versus hydrophobic and hygroscopic HME; †P < 0.001 versus hydrophobic HME. This prospective, randomized, controlled study clearly shows some variations in the ability of the HH and the two tested HMEs to preserve the heat of the ventilatory gases when used in mechanically ventilated patients. Increase in total respiratory heat loss is an undesirable effect during mechanical ventilation. In normal individuals, heat loss is predominantly mediated by sweating, and cutaneous vasoconstriction and vasodilatation. In ventilated patients, use of cold gases renders ventilatory heat loss a significant part of total heat loss. In addition, those patients who are sedated with opioids (and sometimes muscle relaxants in combination) have inadequate involuntary heat-generating and heat-preservating mechanisms. For example, shivering will be suppressed by the sedative agent, and the patient may not produce enough heat by this mechanism to overcome the ambient temperature gradient .If total respiratory heat loss is too high, then mild hypothermia may ensue, with core body temperatures as low as 32-35°C. Blood pressure and heart rate are increased; muscle tone is increased and is frequently associated with active shivering and subsequent increase in oxygen consumption. Also, the level of consciousness may be depressed, which is manifested as stupor or confusion . Under normal circumstances, it has been shown that the upper tracheal temperature ranges between 30 and 33°C, and the RH is approximately 95%, providing a water content of 30 mg/l. However, the optimal humidity of the inspired gas in ICU patients is still a matter of controversy, and the minimum acceptable level has not yet been established. It is suggested that 23-33 mgH2O/l is a desirable range [7,29,30,31,32,33], with a tracheal temperature of 32°C. Some authors have suggested that higher levels of temperatures (35-37°C) are desirable, leading to absolute humidity up to 44 mgH2O/l [2,34,35]. Actually, values published in the literature range from 17-44 mgH2O/l . In humans, during 'nose' breathing of room air, temperature in the subglottic space is 32°C, relative humidity is 98% and the water content is 32.8 mg/l . Dery et al , in 'nose' breathing persons, found a temperature of 33°C and water content of 25 mg/l in the larynx, and a temperature of 35°C and a water content of 35 mg/l at a point 9 cm below the vocal cords. By simultaneous recordings of air-stream temperature at six points in the bronchial tree, McFadden et al  found that, during quiet breathing of room air, temperature was 32°C in the upper trachea and 35.5°C in the subsegmental bronchi. From these data, in patients who are being mechanically ventilated, a gas temperature of 29-32°C and 95-100% RH should be adequate for inspired gases (AH 25-30 mgH2O/l). In addition to achieving adequate levels of RH, AH and tracheal temperature, adequate gas conditioning should also be aimed at minimizing total respiratory heat loss. The optimal level of total respiratory heat loss is not known in ICU patients, but it should be kept as low as possible. The excessive loss of moisture and heat that may occur during mechanical ventilation predisposes patients to serious airways damage. Ventilation with dry and cold gases is complicated by epithelial cell disorders, increased mucus viscosity and restriction of the mucociliary function, the clinical consequences of which are hypothermia, atelectasis and hypoxaemia. On the other hand, over-humidification or ventilation with hyperthermic gases may lead to tracheal burning, alteration in surfactant and epithelial cell disorders, the clinical consequences of which are hyperthermia, hyponatraemia, atelectasis and hypoxaemia. Thus, it is of crucial importance to monitor ventilatory gas conditioning closely, especially in ICU patients subjected to prolonged mechanical ventilation. In the present study, differences in ventilatory gas conditioning were observed. With regard to RH and AH, the HH was clearly superior both to the hygroscopic HME and to the hydrophobic HME. This confirms the results of prior studies [13,15,21] that showed better efficacy of HHs over HMEs. With regard to total respiratory heat loss, major differences were observed with the three methods of gas conditioning tested. Total respiratory heat loss was significantly less with the HH. Twice as much heat loss was measured with either HME than with the HH. The mechanism whereby inspired air composition influences expired air involves the reciprocal exchanges of heat between the respiratory tract and the respired air-stream during the inspiration and expiration phases. Total respiratory heat loss was lower with the HH (Bennett Cascade 2) than with the two HMEs tested. This means that more heat was extracted from the respiratory tract during inhalation after gas conditioning with the HMEs than with the HH. Thus, the reciprocal exchanges of heat and water between the respiratory tract and the air-stream during the inspiration and expiration phases were more favourable with the HH [26,39]. An increased level of respiratory heat loss may be responsible for increased viscosity of bronchial secretions, and subsequent atelectasis. Mucosal injury of peripheral airways has also been documented after ventilation with cold gases, whereas the use of warm moist air did not alter epithelial cells . However, tracheal temperature, either maximum or minimum, was not modified over time with any of the devices tested in the present study, and values obtained in these patients were similar regardless of inspired gas conditioning system. Thus, changes in total respiratory heat loss were not accompanied by similar changes in tracheal temperature, and could not be predicted from the measurements of tracheal temperature, either maximum or minimum. Total respiratory heat exchanges, or enthalpy changes, of the ventilated gases are generally computed by summing the algebraic values of the convective, or sensible, heat exchanges (Equation 1) and the evaporative, latent, or insensible, heat exchanges (Equation 2). 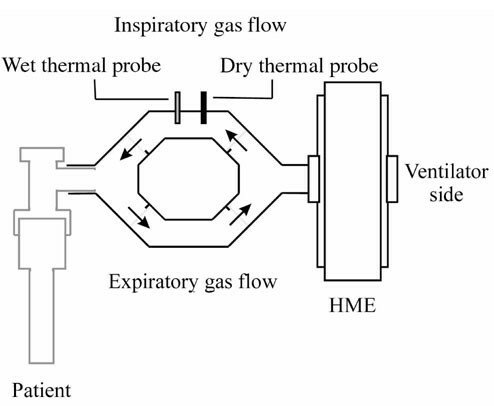 When ventilatory gas conditioning is inadequate, respiratory heat loss is increased, and more heat is extracted by the relatively cold and dry inspiratory gas. Thus, some impact on the tracheal mucosa and a subsequent decrease in tracheal temperature could be expected. Our hypothesis that variations in air tracheal temperature could make it possible to detect changes in respiratory heat loss was not validated by the present study. Technical problems with measurement of temperature can be eliminated because we did observe the expected changes. Larger changes in tracheal temperature were observed when it was recorded during inspiration and expiration; 2-3°C differences were indeed observed between maximum and minimum tracheal temperatures (Tables 2 and 3). Also, no significant differences were observed when maximum tracheal temperatures were compared after 24 h of ventilation with each ventilatory gas-conditioning system. The same lack of difference was observed with regard to minimal tracheal temperatures when they were compared. The specific heat of gases is relatively low, whereas the latent heat of water is much higher. Heat would therefore tend to be lost when respiratory gases have a low absolute humidity. Because the absolute humidity with a hot water humidifier is considerably higher than with a HME, respiratory heat loss is also higher. The upper airway works as a counter-current exchange mechanism, so that at any point the temperature will vary depending on external and internal conditions. The complexity of this relationship is not fully understood, it may be that humidity rather than temperature is the driving force. We do not believe that the present results were influenced by technical factors. Because the response time of the probes was relatively short, we correctly estimated the true breath-by-breath changes in temperature that occurred. Also, the study patients were randomly exposed to the same three ventilatory gas-conditioning systems, minimizing the risk of possible technical problems. One explanation for the present results could be that, in the case of inadequate ventilatory gas conditioning, heat was extracted from the whole respiratory tract by the inspired air-stream; heat loss would therefore have been spread over a wide exchange surface, leading to minimal or even nonmeasurable changes at the tracheal level. Based on the findings of the present study in ICU patients, we conclude the following. First, total respiratory heat loss was significantly higher with either tested HME than with the HH, suggesting that a greater amount of heat was extracted from the respiratory tract during inhalation phase with the two tested HMEs than with the HH. Second, despite significant differences in total respiratory heat loss, no concomitant changes in tracheal temperature were observed and no significant differences were observed in the values of tracheal temperatures obtained with the three devices. Thus, tracheal temperature, although easy to measure, is not a reliable index of total respiratory heat loss.